The PFRM-4 series is a 4-Channel Frequency Reference Module that provides a highly stable sine wave outputs. This series is categorized into PFRM-4-10 series which output 10MHz, PFRM-4-50 series which output 50MHz and PFRM-4-100 series which output 100MHz. PFRM-4-10 series is a 4-Channel Frequency Reference Module that provides a highly stable 10 MHz sine wave outputs. This series offers two enclosure options depending on the type of connectors for the external interface. The OCXO with excellent performance, housed into this series provides a temperature stability from ±25 ppb to ±50 ppb over operating temperature range and aging of ± 100 ppb per year at 25°C. Also this series offers excellent phase noise performance of -160 dBc/Hz @10 KHz offset from 10 MHz Output. PFRM-4-50 series is a 4-Channel Frequency Reference Module that provides a highly stable 50 MHz sine wave outputs. This series offers two enclosure options depending on the type of connectors for the external interface. The OCXO with excellent performance, housed into this series provides a temperature stability from ±25 ppb to ±50 ppb over operating temperature range and aging of ± 100 ppb per year at 25°C. Also this series offers excellent phase noise performance of -160 dBc/Hz @10 KHz offset from 50 MHz Output. PFRM-4-100 series is a 4-Channel Frequency Reference Module that provides a highly stable 100 MHz sine wave outputs. This series offers two enclosure options depending on the type of connectors for the external interface. The OCXO with excellent performance, housed into this series provides a temperature stability from ±25 ppb to ±50 ppb over operating temperature range and aging of ± 100 ppb per year at 25°C. 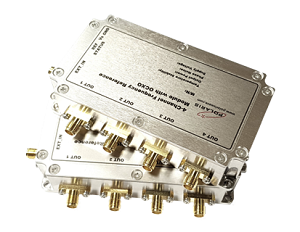 Also this series offers excellent phase noise performance of -160 dBc/Hz @10 KHz offset from 100 MHz Output.